Extracted article from https: // lesjardinsdici.com/2017/10/26/europom-2 017/ with kind Jean-Jacques Lescure's authorization. 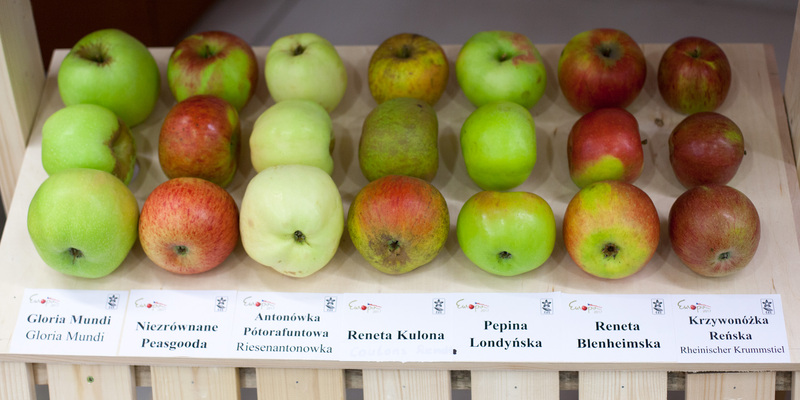 Organisations from twelve European countries exhibited seven hundred varieties of heritage apples and pears from 5 to 8 October at Europom 2017 in the Czech Republic. Here are some of the countries’ contributions I witnessed. Three weeks ago, I travelled by train from Prague to Olomouc in Moravia, to the east of the Czech Republic, where Europom 2017 was to take place as part of the largest international horticultural exhibition and trade fair of the country, expecting 30,000+ visitors. On Wednesday 4 October afternoon, after a comfortable trip in a second class carriage with excellent Wifi access, I, the representative of the French exhibiting organisation LES CROQUEURS de pommes®, was kindly picked up at the station by the organisers of the show with the apple samples I was bringing with me. The Czech Union of Allotment and Leisure Gardeners, a 170,000 members strong association celebrating its 60th anniversary, treated us with great care throughout the fair. Their stall was the largest and they had planned conferences and visits that enabled us to exchange knowledge and best practices during four days of intense activity. Early hours, before the opening of the exhibition to the public at the Flora exhibition centre. Photo 6 October, Olomouc, Czech Republic. 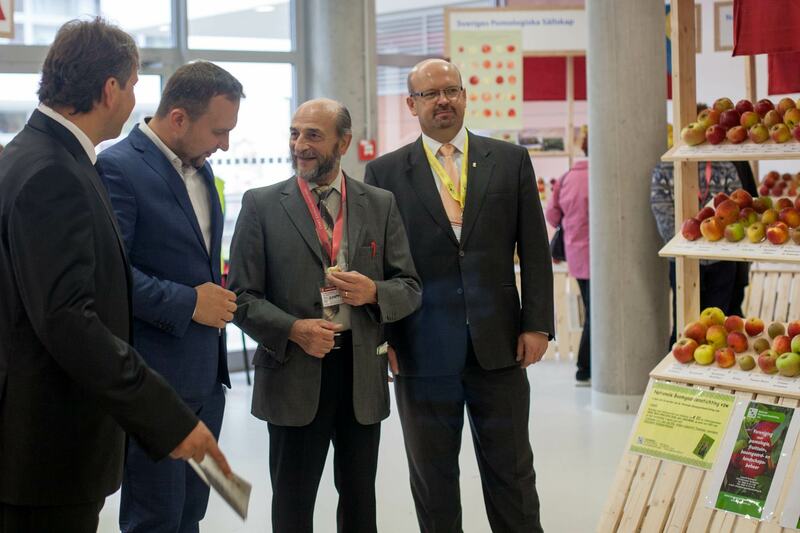 The NBS chairman in conversation with the Czech Minister of Agriculture in the presence of the chairman of the Czech Union of Allotment and Leisure Gardeners (right), and the head of the Flora exhibition centre (left). Photo 5 October. With five organisations contributing to Europom 2017, Germany was the most represented foreign country. German also was, after English, the most spoken language throughout. Having said that, most of the conferences were held in Czech, with simultaneous translation in English. One of the German stalls. NPV (Noordelijke Pomologische Vereniging), which ‘stimulates the use of old varieties and the cultivation of high stem fruit trees’, represented Holland. 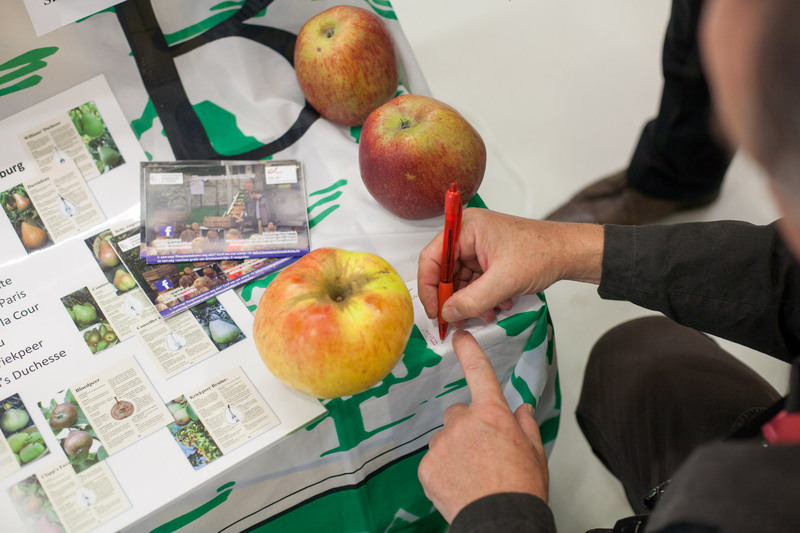 A British Bramley cooking apple, an unusual reddish colour, next to Dutch varieties on the NPV stall. Graft wood travelled a lot throughout history, which explains that cultivars from one country can be found in the heritage list of varieties of other countries. We had a conversation about a variety displayed both on the French and Austrian stalls: the ‘Api noir’ in French, ‘Schwarzer api’ in German (= Black api). Firstly, The British National Fruit Collection, based in Brogdale, United Kingdom, which holds 2,500 varieties of apples from the entire planet, describes the ‘Api noir’ as an internationally recognised variety of ancient origin coming from France, found in other countries of Europe under synonyms like ‘Black lady apple’ in the UK and ‘Schwarzer api’ on the continent. Therefore the Schwarzer api and the Api noir displayed at Europom 2017 were very probably the same variety. Genetic tracing would confirm this. Secondly, it is probable that the graft wood used to grow the Api noir at Brogdale, pictured on the British National Fruit Collection website, came from the same area in France as the sample we displayed on the French stall, the Auvergne region. Indeed, the ‘accession’, in the pomology jargon used to describe a new entry in a given collection, of the Api noir at Brogdale dates back to the early 1950s’, when the Auvergne sent several varieties to populate the world-famous British conservatory orchard in Kent with foreign varieties. This would explain how close indeed the Api noir on the French stall was to the picture of the same variety on the Brogdale website. The Schwarzer api displayed on the Austrian stall may have evolved through the centuries to a slightly different appearance, a bit more red? The Api noir on the French stall. The Schwarzer api on the Austrian stall. 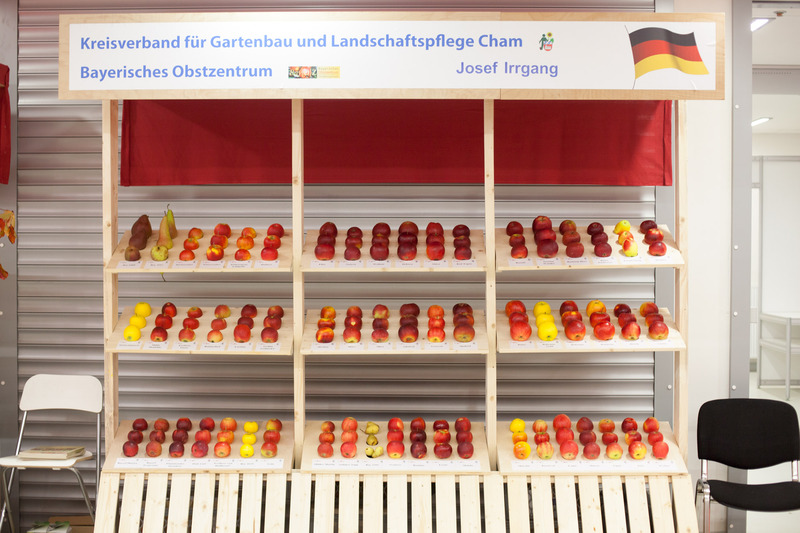 The average apple on the Polish Research Institute of Horticulture InHort stall was significantly bigger than the apples displayed on the other stalls. Seven of the fourty two varieties displayed on the Polish stall. The Polish pomologist thought that this even bigger apple of undetermined origin on the Belgian stall was of Russian origin. He writes the name down for the Belgians to carry out further research. Two delegations represented this country, including an active organisation dedicated to nature conservation in the White Carpathians called Pangaea. They were particularly active with fruit identification and tasting throughout Europom 2017. On the last day, I joined the delegate from Luxembourg to look at their beautiful pictures of centenary trees in the Slovakian countryside, sheep grazing in the orchards and of their nursery of high stem fruit trees. We discussed their horticultural practices and long-term vision. I showed a ‘Belle limousine’ sample brought from France, harvested from a 80 years old tree which requires little care and can produce more than a ton of apples a year, only fed by the sheep that protect themselves from the sun under them. We agreed that this form of arboriculture should be given a future. A young team of very dedicated Slovakians during a tasting session on 5 October. We talked about a possible contribution of Les Croqueurs de Pommes of Northern France to a sweet cherries conservation project, and of various topics beyond fruit trees, for instance extensive pasture land in the volcanos of Auvergne and the growth of arnica plants. We also agreed that the Slovakian Pangaea initiative cited above should be supported. We found their drive and energy to produce fruit in their local community according to the principles of long-term sustainable development quite convincing. It was the first participation of The Swedish Pomological Society to Europom®. Among the various conversations we had, we talked about ways of spotting old fruit trees in a country of such low population density (22 inhabitants per square kilometer, five times less than in France and twenty times less than in England). We are very happy to know that the Society will attend Europom 2018 in France. In the meantime, I hope we will make progress on the question of the ancient forests of Kazakhstan and other countries of Central Asia they would like to visit to see their wild apple and apricot trees. 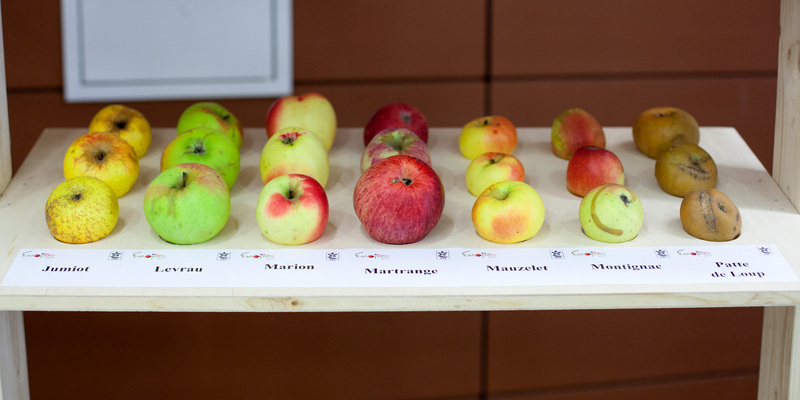 The Swiss delegate was an expert of both the conservation of old fruit varieties and the development of new cultivars for commercial production. So we not only discussed biodiversity preservation but also fruit breeding. I also understood why there were so many apples in the commercial orchards between Geneva and Lausanne and in the Valais this summer, whilst so many fruit trees suffered from frost in Western Europe this year. The Swiss delegate told me that frost had not been that bad around Lake Geneva and, most interestingly, he described the methods professional growers use to avoid frost damage, such as sprinkling the flowers with water at the right time of night and day so that a thin ice coating forms and protect them. The British exhibited more pears than usual, as with only 20% of the normal annual production at the Royal Horticultural Society’s Wisley Garden conservatory orchard due to frost this spring, there were not that many apples to show. It was great for me to meet the delegates of the RHS Fruit Group. It was during my visit to Europom 2010, which took place at Wisley, near London, that I found my first opportunities to engage in local fruit growth and use with people who shared the same aims as me. What I liked best was the story of the re-creation of a historic orchard in the UK which happened to be a failure, explained in a seminar for the renovation of the XVII century Kromeriz palace orchard in Moravia on Saturday 7 October. British humour was cleverly used to show our audience how important it was to appoint skilled arboriculturists along with historical site curators to implement the project successfully. 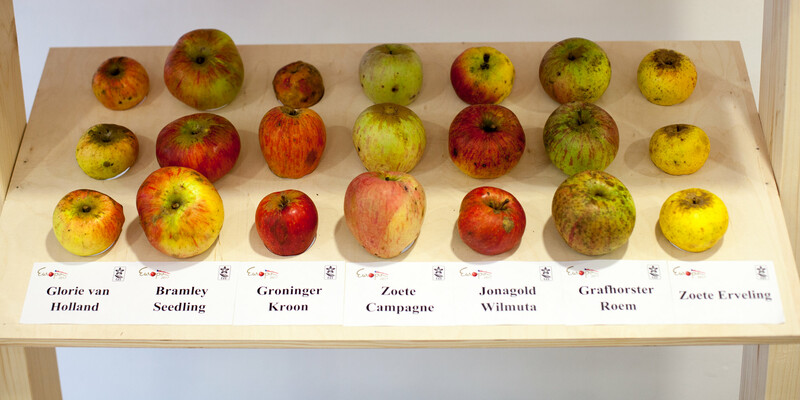 We, LES CROQUEURS de pommes®, managed to exhibit apples from twenty different regions despite serious damage caused by frost in many places across the country. For instance, in the Southern Alps a 3,000 strong conservatory orchard we take care of produced ‘less than ten apples per tree on thirty trees, which the hornets fought for’. I used case studies and literature references from XVII century arboriculture practices for instance at Versailles, provided by our Île de France local association, to contribute to the Kromeriz Palace seminar. I drew a number of tree shapes developed during that century, which can be found in arboriculture treatises of the time such as the publications of Jean Baptiste de La Quintinie, who created the ‘Potager du Roi’ for Louis XIV. Overall, it was great to meet and exchange with organisations operating in various parts of Europe who share the same goals. 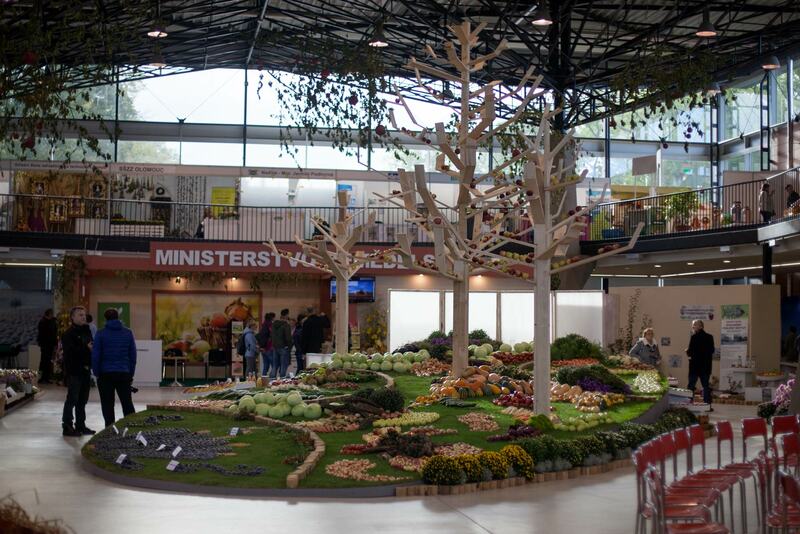 We look forward to welcoming Europom 2018 in France next year, on Saturday 27 and Sunday 28 October in Troyes, to see how much progress we have made in the conservation of our common fruit heritage and promotion of sustainable arboriculture practices ! This line of apples contains two of my preferred varieties among those Les Croqueurs de Pommes exhibited. I liked the ‘Marion’ for its beautiful pink and yellow colour, and the ‘Patte de Loup’ (literally wolf paw) for its name and characteristic stripe, as if a wolf had scratched the fruit.